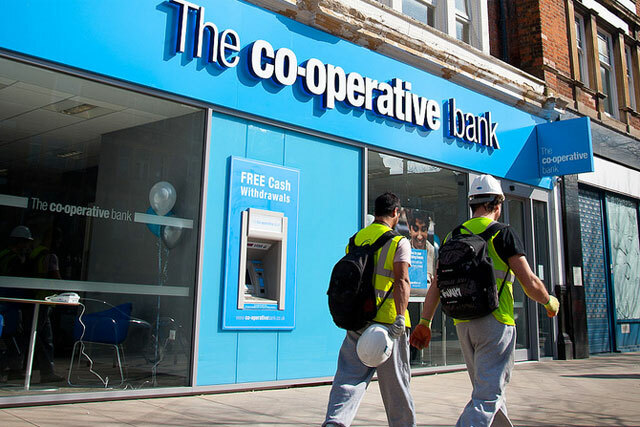 The Co-operative Bank has posted pre-tax losses of £1.3bn and admits it does not expect to report a profit for two years. The losses were in line with expectations after the bank failed to buy 632 branches from Lloyds Bank last year, after the Co-op discovered a £1.5bn black hole. At the time it ran a series of ads to reassure customers over the state of the bank. The bank apologised to its 4.7 million customers, and said it would not make the £5m in deferred annual bonuses to its former executives. Chief executive Niall Booker said: "We appreciate that customers and other stakeholders continue to feel angry about how past failings placed the future of the business so seriously at risk. "I would like to apologise to them, to thank them for their continued loyalty and to thank colleagues for their commitment during such difficult times." In addition, the bank said up to 40 of its high street branches will close. Parent company Co-operative Group lost control of the bank in December to a group of US hedge funds that led its rescue. The group now owns 30% of the bank. Joshua Raymond, chief market strategist of Cityindex.co.uk, said: "This earnings report is packed with negative sentiment. The bank will continue to post a loss for a minimum of the next two years and has moved to withhold bonuses worth £5m. "This is a pretty damning earnings report filled with the severity of the problems the bank faces as it looks to turn itself around. The one real positive from the earnings is perhaps the fact there is no big negative surprise. Market expectations were severely low and these were met. "They are now venturing down a long road to restoring the banks reputation as well as customer and investor confidence. That road is laden with potholes and investor fury but now at least the bank can start on this inevitable journey."